The Palace Garden Gate was built to commemorate the International Exhibition of 1879. The Sydney International Exhibition opened the doors of its main building the 'Garden Palace' on 17 September 1879 and closed them seven months later. Many figures in colonial Sydney talked of the success of the huge project and the Commissioners of the Sydney International Exhibition certainly felt it had "undoubtedly emphasized a new era in the history of the Colony, and projected the value of Australia on the minds of the inhabitants of those older countries". But the 1,045,898 visitors that passed through its gates were perhaps the most eloquent testimony to its triumph. The Garden Palace was a large purpose-built exhibition building constructed to house the Sydney International Exhibition (1879). It was designed by James Barnet and was constructed at a cost of 191,800 Pounds in only eight months - largely due to the special importation from England of electric lighting which enabled work to be carried out around-the-clock. It was constructed primarily from timber, which was to assure its complete destruction when engulfed by fire in the early morning of September 22, 1882. 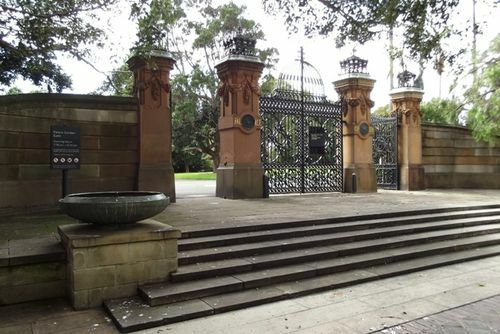 Few people passing through the gates which give access to the upper Botanical Gurdens from opposite Governor Bourke's statue, realise their significance. That they are a fine example of the ironworkers art is seen from the beautiful picture published on the front page of "The Sun" to-day. Beyond that, however, they are a permanent record of the growth of Sydney. They are designed to perpetuate the memory of the "Garden Palace," in which were housed the exhibits gathered together at the first international exhibition held in Australia. They do more than that because the design is fashioned on the chief characteristics of the exhibition building Itself. On each of the four columns are replicas of the ornamental coverings which adorned the four towers of the building, and the centre of the double gates is surmounted by a faithful representation of the dome, which was the predominating feature of the Garden Palace. On each of the two centre gates are medallions which are reminiscent of the medals distributed to successful exhibitors, and those holding official positions. The Garden Palace was burned down in 1883. Sun (Sydney), 19 July 1923.